Home > learn to be a dog trainer > What are students saying about the School for Dog Trainers? Class 50 is just over halfway through our Master Dog Trainer program. This course provides students with the tools, experience and knowledge they require to become a professional dog trainer. Our students started their journey on January 7th, and their course will finish towards the end of June. This semester’s intake has seen a mixture of students, each with their own unique backstory and all with different experiences of working with dogs. At the School for Dog Trainers, we teach attendees from all over the world who want to take the next step on their journey to become a dog trainer. The Master Dog Trainer program is perfect for anyone with an interest in dog training – a six month course with a mixture of classroom education and hands-on experience with a variety of dog breeds. Each week on our Facebook page, we feature one student as our ‘Student of the Week’. What do they have to say about their experience so far at the School for Dog Trainers? The Master Dog Trainer program involves both classroom tuition from professional experts and practical, hands-on training with dogs. What do our students think of these methods, and do they find it a beneficial way of learning? Hailing from Puerto Rico, Paula has always had an interest in working with animals – she volunteered at a local animal shelter whilst she was in college. It was actually Paula’s mother who recommended she enroll in a program at the School for Dog Trainers. What does she have to say about the balance of theory and practical on her course? Grace and her dog Greta are from North Carolina, where she has worked at a boarding, daycare and training facility since 2010. When Grace finishes the program at the School for Dog Trainers, she plans to use the knowledge she gained and apply it to her work at the facility. What does she think of the mixture of teaching methods? The comprehensive curriculum of the Master Dog Trainer course includes the material, lectures and practical training of these courses. Do our students have a favourite aspect of the program? From New Jersey, Paul joined the Marine Corps after high school and was stationed in California (learn more about our VA benefits). With his two German Shepherds, Paul has a hard-working, unbreakable spirit and wants to learn as much as he can to start his dog training career. What has his favourite part of the program been so far? Abby from North Carolina has grown up around animals and wants to help the lives of dogs and their owners by pursuing a career in dog training. What has Abby enjoyed most about the Master Dog Trainer course so far? All classes at the School for Dog Trainers are delivered by dog training instructors who have history and experience in the industry. Our tutors help our students to achieve their potential, including by offering the popular Student Excellence program. What do our students think of their instructors? Patrick from South Carolina fell in love with training after getting his dog, Odin. He realized the only way to improve as a trainer was working with as many dogs as possible, and loves helping the police and military community with their dogs. Does he think the instructors at the School for Dog Trainers are helpful? 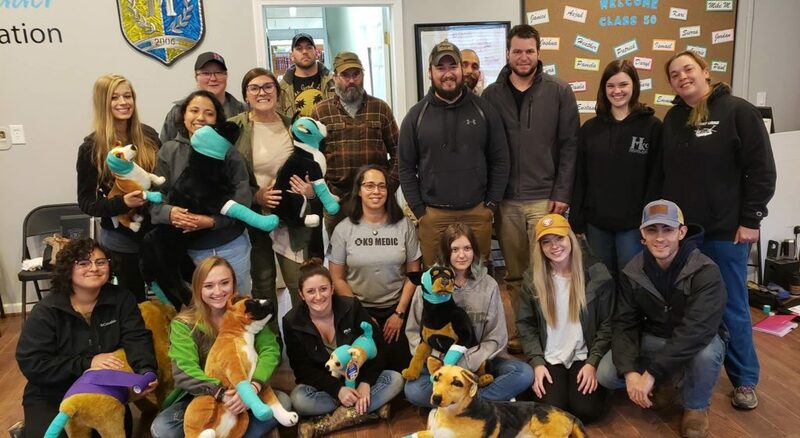 Our students learn so much from these experiences, gaining a deeper understanding which they can apply to their career as a dog trainer after they graduate. At the School for Dog Trainers, we pride ourselves in teaching our students so they can succeed in this competitive field. We have students from a variety of backgrounds – some with no prior experience of dog training, and others who wish to learn more about the art of training to supplement their existing skill set. How would our students summarize their experience at the School for Dog Trainers? We are grateful for all of our Class 50 students and wish them all the best for the remainder of their studies at the School for Dog Trainers! Should I become a dog trainer? – read more about working in the dog training industry. Apply – you can submit your application online today!